Bill Hall presents the First Annual SGICC EH&S Award to Donny Beaver, CEO of HalenHardy for their MAASH Mobile Air Shower System developed to remove Respirable Crystalline Silica Dust. Paramount to the success of the shale gas industry is their ability to operate in an environmentally responsible, safe manner, gaining the trust and respect of the citizens, the communities where they operate, and the workers they employ. Innovation is a cornerstone of the industry. From the vision that George Mitchell had that transformed the extraction process to the advanced methods now being employed during virtually every step of process, new technologies are paving the way for the industry’s success. 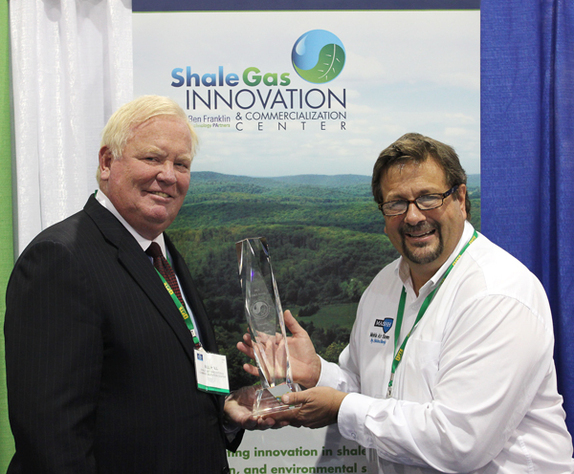 The Shale Gas Innovation & Commercialization Center (www.sgicc.org) is proud to announce our First Annual EH&S Award to honor one innovation that we believe will be an important advancement in the industry’s operating procedures to improve the environmental, health and safety of their workers and the communities where they operate. Annually we will survey the proposed or commercially available new technological advancements in the EH&S area for the shale gas industry and choose one winner to highlight. The objective of the award is to place a spotlight on the importance of EH&S to the shale gas industry, by highlighting the new technologies that are being developed every year to promote continuous improvement in this area.